Keeping it real here. Parenting can be exhausting. Currently in my home I am parenting kids with diagnoses ranging from ADD, dyslexia, Crohn's disease, PTSD, early trauma, and plain ol' everyday adolescence! I don't want to parent from my current mood or energy level, but instead to parent with a plan. Having a go-to list of "One-Liners" to say at opportune parenting moments is a tool that helps me meet that goal and save my strength. As a Parent and Family Coach, I have helped other parents learn about and use One-Liners effectively as well. This series is a compilation of 15 of my favorite One-Liners. 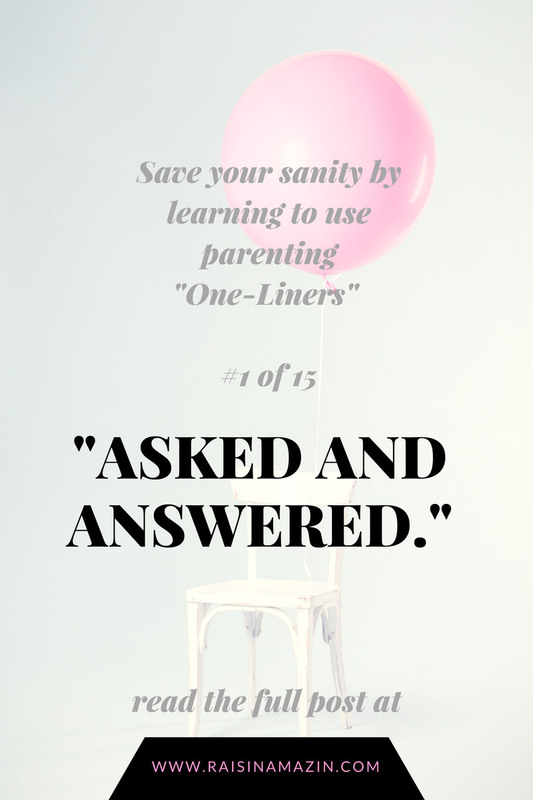 Before you use One-Liners as a parent, caregiver, or teacher, it is important to emphasize that these are NEVER said in sarcastic or angry tones. They are ONLY to be said after taking a deep breath and looking into your children's eyes with kindness, despite their current behavior choice. "Asked and answered" is a One-Liner for you as parents to say when your child has (usually repeatedly) been asking about or for something that you have already given your response to. When can I watch TV? Why can't I use that? How come they get to do that and I don't? Can I ride my bike around the block (out of sight)? As long as you have clearly explained your answer at least once, then out comes this One-Liner: "Asked and answered, (Sweetie, Pumpkin, Snuggs)." respect the answers of those with the authority to direct them (ie parents, teachers, police officers, etc). Saying to them "Asked and Answered" is a respectful, clear, and direct parenting statement. When spoken in a calm, non-sarcastic tone, it can be a helpful reminder to your child that it is respectful to accept "No" for an answer and that wearing a parent down with repeated asking is NOT an effective strategy. Having go-to planned phrases can also serve to keep you as parent from spiraling into further frustration (or other fight-flight-freeze responses). If you have any questions about how to use One-Liners in parenting or to begin a Coaching Group Class or One-on-One Coaching Program, please click the blue bar at the top of this page (Schedule a Free 30 Minute Discovery Session with Hannah). Up next in the One-Liners for parents series: "Car Rules."